_The BBCS Ministry Team is gearing up to present another inspirational story to area churches during the winter and spring months. This year’s theme is Three Weak Women: Gladys Aylward, Mary Slessor, and Amy Carmichael. The Ministry Team was created to give BBCS students an opportunity to develop their music and drama gifts through ministering in local churches. It also serves to introduce the community to the various programs the school has to offer. The BBCS Ministry Team presents "Bridge of Blood" the story of how Jim Elliot and four of his missionary partners took Christ to the Aucas in 1956. The readers theater piece, written by David H. Robey and produced by Lillenas Publishing Company asks the question, "What would cause five gifted, personable young men with sweet wives and little children to go to the mission field…to die?" 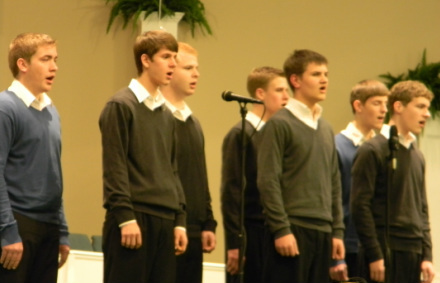 The team of 15 senior high students will be traveling and performing at area churches this spring.